I recently read a post written by Chrissie, who writes Vamp it up Manchester, called "30 Random Things I Appreciate" and I really liked the idea of sharing with you my list of things I appreciate. Sometimes we take things for granted or we don't recognise the smallest things that bring us happiness in our lives no matter how random that be! 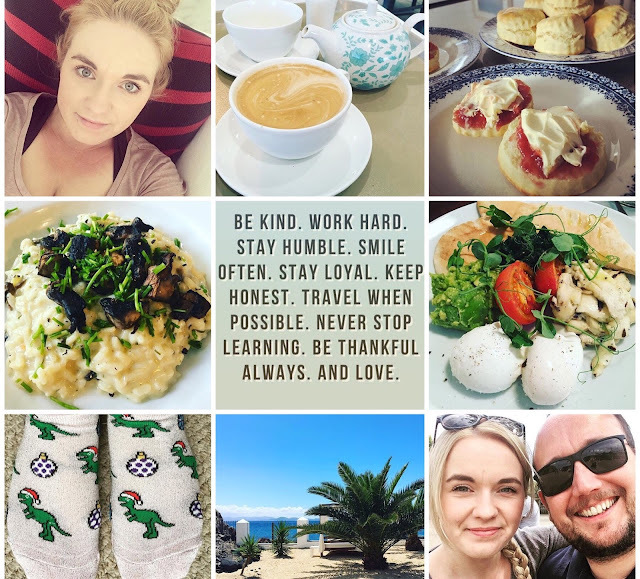 I love reading these types of posts by other bloggers so I hope you appreciate my random list - feel free to share yours too! 1. Someone making me a cup of tea, especially at work! 2. Getting a good nights sleep. There is literally no better feeling. 3. Air conditioning. My other half got air conditioning installed in our bedroom which I thought was a bonkers idea but when I am drying and straightening my hair it's amazing. 4. 30% less sugar fruit pastels - I am a sweet monster and eating these makes me feel like I am being really good. 5. A proper latte from a coffee shop. I am a coffee snob and hate instant coffee. 6. Hugs - no explanation needed. 7. Gousto subscription boxes. If you have never tried Gousto you just must! It's easy, it's delicious and because I live with a vegetarian it makes meals varied and delicious. I have reviewed it HERE. 8. 90's and 00's music - It brings me so much joy you would not even believe. 9. Caramel Frappe from McDonalds, you wouldn't think they are nice but.....oh my god! 10. Having a good skin day. As I have gotten older my skin has become problem prone so a good skin day makes me smile. 11. My photo light box my boyfriend bought me, it makes taking blog pictures 1000x better than they were. 13. My hair. I love my hair. 14. Apple music - My other half subscribes to Apple Music for us and I can listen to all of my crappy music until my little heart is content. 15. A good quality breakfast, not your usual fry up. I'm thinking halloumi and avocado! A firm favourite place to go for me is Attina in Chester which I have reviewed HERE. 16. Novelty socks. I am not sure why but they give me such happiness! 18. Our robot vacuum cleaner, Roomba, she is amazing (yes it's a she). 19. A high quality steak, cooked medium rare. 20. When my boyfriend cooks my tea for me after a long day. 21. A good throw, I have 3 fleecy ones at home and I love them! 22. Comfy shoes - gone are the days of ridiculously high heels, give me comfort any day. 23. Finding a heart warming quote online. 24. Being close to the sea. 25. Long drives for no reason other than to just have a look around. 26. When my boyfriend tells me how proud he is of me. 27. Chamomile tea before bed. 28. Instagram, I love looking at pictures. 29. When a friend randomly messages me to see how I am. 30. And last but by no means least is my other half for just being him, in a weird and wonderful way and putting up with me and my weird and wonderful ways. If you made it too the end of this list then well done! Please leave me a comment with a random thing that you appreciate or something that brings you lots of happiness! nothing beats a decent cup of coffee!